I’ve been playing around with the perfect “white” enchilada recipe. I’ve used these fantastic Honey Lime Enchiladas as my go-to recipe for a while but I’ve also wanted a creamy, white enchilada that really rocks. Thanks to inspiration from my lifelong friend Liz P. and my mom’s famous recipe, I think I’ve finally stumbled upon the version that we love best. Deliciously cheesy and creamy, a homemade white sauce is paired with a chicken filling that is ingeniously mixed with cream cheese and green chiles before being rolled into flour tortillas. 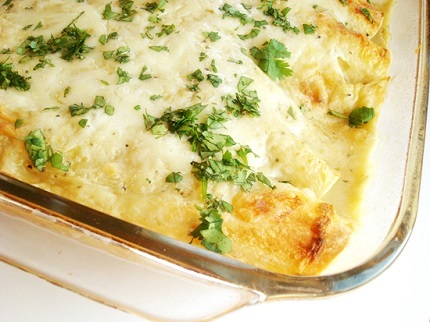 Baked to golden perfection, these enchiladas are filling and ever so tasty. The fresh cilantro on top is optional but adds a fantastic fresh pop of flavor to the entire dish. Probably not considered the healthiest meal in the world, the taste will certainly make you feel less guilty for indulging. In a medium bowl, combine the softened cream cheese and green chiles. Mix well. Add the chicken and black beans. Mix to combine. Set aside. In a large nonstick skillet, melt the butter over medium heat. Add the onion and cook, stirring occasionally, until the onion softens and starts to turn translucent, about 3-4 minutes. Sprinkle the flour over the onions and stir well. Cook for 1 minute, stirring. Slowly whisk in the chicken broth and milk. As you whisk and the mixture cooks, the flour will get less lumpy around the onions and the mixture will become smooth. Cook over medium heat until the mixture is bubbling and has thickened, about 4-5 minutes. Remove the skillet from the heat and stir in the enchilada sauce and sour cream. Lightly grease a 9X13-inch baking dish. Spread about 1/4 cup of the sauce on the bottom of the dish. Fill each tortilla with about ½ cup of the chicken/cream cheese filling. Top with a small handful of shredded cheese, a couple tablespoonfuls for each enchilada. Save at least 1/2 cup cheese for the top of the enchiladas. Roll the tortillas up and place seam side down in the prepared baking dish. Continue filling enchiladas until the dish is full (I can easily fit 8 enchiladas in one pan). Pour the white sauce over the top of the enchiladas. Top with remaining cheese. 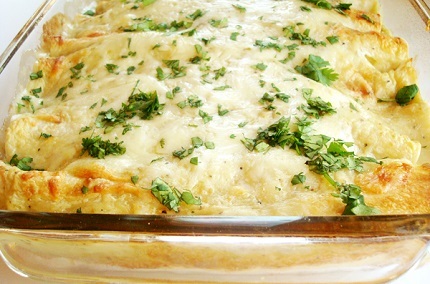 Bake for 20-30 minutes until the enchiladas are bubbling, hot and lightly browned. Sprinkle fresh cilantro over the top and serve. Make Ahead Instructions: Follow the recipe instructions, letting the sauce cool to warm room temperature before proceeding with filling the enchiladas. Assemble the enchiladas as directed in the recipe with the cooled sauce. Cover the baking pan with plastic wrap and refrigerate for 8-12 hours before baking. Bake according to the recipe, adding an additional 5-10 minutes if needed since the enchiladas were refrigerated. Alternately, after assembling, the baking pan can be covered with a double layer of foil and put in a jumbo-sized resealable bag and frozen for up to two months. Bake from frozen by decreasing the baking temperature to 350 degrees F and baking the enchiladas covered for 1 1/2 hours. Uncover and bake an additional 30 minutes to 1 hour until the dish is hot and bubbly.